There are some things you know because you’ve been taught, some things you know through experience, and some things you just sort of figure out through observation and equal portions of common sense and courtesy. As graduation season comes to a close, it occurs to me that there is an unspoken etiquette one must follow when sending and receiving graduation correspondence–at least that’s been my experience. And because I’ve decided it’s better to shine a light than curse the darkness, I wanted to share with you, dear reader, my wealth of information about graduation season, and perhaps prevent a potentially embarrassing faux pas in the future. Over the past several weeks, I have received several graduation announcements from distant nieces and nephews, children of women in my Bunko group and the young lady at the end of the block I used to buy Girl Scout cookies from. Since many of the graduation ceremonies are being held on the same day, I can’t possibly attend them all. How can I graciously decline these invitations and how do I determine which ceremony I actually do attend? Relax. A graduation announcement is not an invitation to the actual ceremony, it is merely an invitation to send the graduate a gift, preferably in the form of a check or money order. In the event that you receive an actual invitation, be advised that the graduate or the parent of the graduate considers to a special friend or relation, therefore the gift should be at least thirty dollars. If you were actually expected to attend, you would have already received a phone call confirming your attendance. If you receive an invitation to a graduation party, congratulations. You are in the inner circle of close family and friends. You probably already know whether your presence is expected. It’s been my experience that if the graduate is young enough to be your son or daughter, you may politely excuse yourself after hors d’oeuvres and/or dinner has been served so that the young folks can crank the music and get their freak on. Thank you so much for the gift! It really means a lot to me. I had a very special day. The above was an actual thank you card I recently received. Unless you bought the graduate a new car or paid for their first year of college tuition, a generic thank you card is perfectly acceptable. In this age of electronic communication, it’s nice to get a hand written thank you note from anyone, let alone an 18 year old whose main source of written communication is texting on their phone. And while I know the same note may have been written to several people, knowing the kid (and his mother), I also know that his appreciation was sincere. So there you have it. I hope I’ve helped in some small way to demystify the secret language of graduation correspondence. Any recent graduates in your life? Any sage advice to pass on that I may have missed? It’s graduation season again. It seems like every year we get at least one of two graduation invitations–mostly from kids we know from church, but this year we received invites from some very special kids, special to me, that is. Because these kids grew up right before my eyes. I swear it was only last week they were graduating kindergarten, and now here they are about to enter college. Even though they’re not my own, I’m so proud of them all, and their graduations remind me how little time I have left before my own kids will be sending out those invitations. But that’s not the only graduation invitation we received. We also have a good friend graduating from law school. After three years of juggling a blended family with four kids (the fourth being born a little over a year ago), heading up the children’s ministry at our church, AND going to law school, she now has a law degree and a bright future ahead of her. I love that quote, and not just for the graduate. It’s for you, too. It’s your life. Live it or live in it. For the first time since my now 14 year old son was an infant, we spent Christmas away from home. This was also the first year we didn’t leave milk and cookies for Santa, because my 10 year old daughter informed me a few months ago that gig was up. Spending time with both sides of the family during the holidays can be difficult to do. Throw a divorced set of grandparents into the mix and it can be a logistical nightmare. Fortunately, my divorced parents are both within a few hours drive of us, so we usually visit my dad and his wife one weekend in December and reserve Christmas day for spending it with my mom and sisters, who live here. This year, we exchanged gifts with both of my parents, my sisters, my brother and his family (via airmail from Hawaii) and with each other prior to December 25. My in-laws have gotten the short end of the stick when it comes to spending time with the grand kids at Christmas because my husband and I decided when the kids were still small that we would spend Christmas at home. But this year was different. Because not only were we celebrating Christmas, we were also celebrating my father-in-law’s 90th birthday on December 22. That’s a pretty big deal in my book. So we packed up the kids and Buddy Love the Dog and headed to New Mexico. The party was wonderful. My father-in-law shared a little about each decade of his life. It’s really quite amazing all the modern conveniences we take for granted. -A nine hour car ride home on Christmas Day with nary an argument between my kids. Thank you, Jesus for books and electronic devices beginning with the small letter “i”. -Time away from my computer. Time spent reading 11/22/63–Stephen King’s latest novel. It’s a monster of a book, and I seriously doubt I would be almost finished with it had I not been away from all of my usual distractions. I’ll let you know my final verdict when I’m done, but based upon what I’ve read so far, I’d say it’s one of his best. If you’ve read “It”, you gotta read this one. Some old friends from Derry resurface in 11/22/63. There are few things in life I enjoy more than getting lost in an epic story. -Games of train dominoes, homemade Chex mix, cookies, candy and way too much food. Conversations and nightly play along Jeopardy and Wheel of Fortune viewings. Little things, but memorable ones. These gifts were unexpected but cherished, but not all gifts received are cherished. Sometimes when you receive a gift and you say, “Oh, you really shouldn’t have”, what you mean to say is, “No, you REALLY shouldn’t have!”. Hope y’all are having a blessed holiday season, if not downright joyful. but the gift bearers themselves. Feeling very blessed and grateful. Hope you are as well. There are too many decorative pillows on my bed. Why all the pillows? Because I love the idea of a beautifully made bed, I just don’t like to spend the time it takes to make that idea a reality. 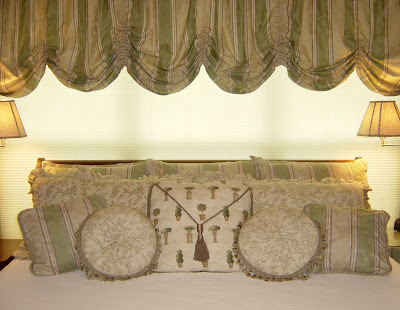 I would prefer to have bedding that was less fussy, but I resist the change. Why? Investment – The bedding is seven years old. Even so, it’s in good condition. It was also custom made and a lot of money was spent on it. (In the interest of full disclosure, I’ll tell you that my mom is an excellent seamstress, so the cost of labor wasn’t the issue, and my mother-in-law bought the fabric as a house warming gift. But the fabric was still expensive, and money was spent.) 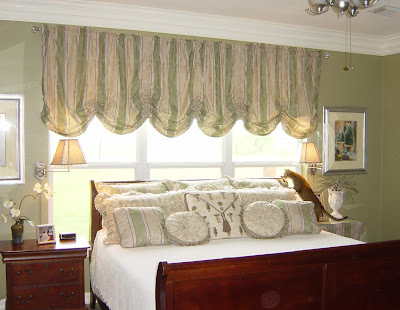 The matching window treatment is also custom made, as are the coordinating window treatments in the adjoining master bedroom. Then there’s the coordinating paint and accessories, etc. It seems like such a waste of time and money to redecorate just to avoid making my bed every day. But in the end, it’s just stuff. Pretty nice stuff, but stuff all the same. Perhaps I should make my bed every day. Then I could enjoy the beauty of a beautifully made bed. But sometimes I think the things we want to own end up owning us. It’s a struggle for me. I need to simplify, and enjoy the gifts that cannot be bought with money. The gifts that are priceless.